I will permanently bear the mark of a woman who has lost her child. Many of us are walking here - in the grocery store, at the neighborhood barbeque, at the movies. We walk without necessarily recognizing each other, side by side and a million miles apart. If you are one of these women, I want you to know that as I write these words, I am praying for you. I am mourning for what you have lost in this life. I am praying that God will fill you as only He can, and that in time, you (and I) will be with our daughters and sons again. Owen Paul Marx was due August 23rd, 2011. I never in a million years thought I would make it to my due date. I was HUGE and both Braden and Addison had been early, although not by much. I thought I would maybe be a week or so early with Owen. He was my third so I thought maybe things would move along a little faster. As I went into that last month, I felt great.... I even remember laughing when I was making those last several appointments and the receptionist scheduled me for an appt. on my due date and for the week after. I thought, there's no way I'll be at those. Towards the end of the pregnancy I was having Braxton Hicks contractions like crazy.... Owen was head down and had been for some time. Everything was ready..... We repainted Braden's room because the boys were going to share. We painted it a dark orange color, sort of like a basketball and I found sports stickers to put on the walls and he finally got his new curtains put up. Braden was so excited. I even found a super cool cribskirt that reminded us of a football. I had the changing table ready and was having to remind Braden less and less to use it as a toybox because we had to have room for baby brother. I had all Owen's clothes washed and ready for him....they are still waiting for him in the dresser. I don't know if I'll ever be able to take them out of there. They are his. On August 23rd, I went in for my weekly appointment. 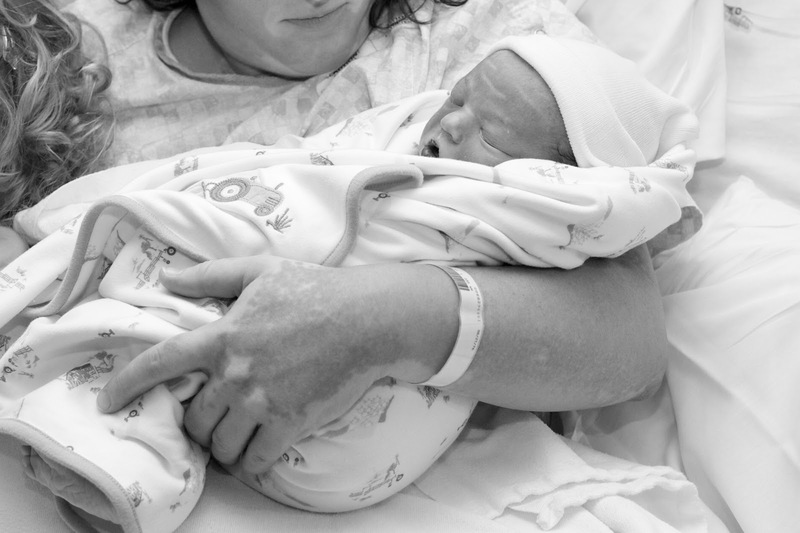 My midwife was so suprised to even see me, she thought for sure I would have gone in by now. My blood pressure was great, no swelling, good weight gain...I felt great. We listened to his heartbeat.... it was 150...same as always. I was still only 1-2cm dilated, which I had been for a couple of weeks. Owen just didn't seem to be in a hurry. I think he was my mellow baby. I was so looking forward to that! For any of you that know Addison, you would know why! HA HA HA I love her dearly but boy oh boy can she be something else.... she is our little princess, and she'll let you know it. On Tuesday, August 30th, I was 41 weeks... I was blessed to have an extra week with our baby. Monday night into Tuesday morning had been hard. I was having contractions from about midnight until 5:30am. There were completely irregular. I would have a few... start thinking, this is it! I should time these! Then they would go away completely for an hour. I would finally fall asleep and then I would have another one that would wake me up. I would think... this is is! I should time these! Then they would go away.... this went on for a long time. I was getting really crabby. I couldn't wait for my appointment that afternoon. I thought SURELY all these contractions have to be doing SOMETHING! I got up at 5:30 or so and had to go to the bathroom. Owen was moving around... I know it. I remember him wiggling around. That is really the last thing I can concretely remember about that day up until the ultrasound. I know I felt him moving at 5:30am. My appointment for the ultrasound was at 2:15pm. I went in there kind of laughing with the ultrasound tech because we were talking about how big I was. She was going to try and get a good gauge on Owen's size and make sure he was still in position. The first thing she checked was his position. She said, "that's good, he's head down...looks good". Then she moved the wand up. As she did that I remember getting a little panicky feeling because on the drive up to the ultrasound I had a fleeting thought that I hadn't felt him move in a while and I just wanted to see that heartbeat and see him wiggling around. I was searching the screen for his heartbeat..I didn't know what I was looking for I was just searching and searching for it. It seemed like forever, but it was probably only a few seconds. In that same moment I heard those words that I wish I could forget. She just blurted out... "Catherine....there's no heartbeat." And I knew it. I knew she was right.... Lord have mercy on us... I knew she was right. Psalm 22:19 But be not thou far from me, O LORD: O my strength, haste thee to help me. The ultrasound tech was young.... I was asked later by someone if she was kind when she told me that there was no heartbeat. What I remember is panic. I think she was totally shocked and just blurted it out. Then she ran to go get my midwife. I remember asking her over and over again if she was sure...she checked a couple more times. She was sure. Owen was gone. His little heart was not beating. All that naivete is gone now. I had to call Derek and tell him the worst news of our lives. I couldn't even talk. I was bawling and not making any sense... my midwife took the phone from me and told him what happened. My poor husband.... he was up on a roof when I called him and then he had to drive 20 minutes to the office. Then I called my mom... she was watching the kids while I was at my appt. Then I called one of my two best friends in the world... I couldn't even handle calling anyone else and asked her to do it.... horrible horrible horrible....... a day I want to forget. When Derek finally came to the office I just remember asking him over and over again how we were going to tell the kids. They were waiting for their baby brother. How were we going to tell them?? What were we going to tell them? We didn't even understand it ourselves. Psalm 30:10 Hear, O LORD, and have mercy upon me: LORD, be thou my helper.